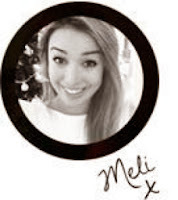 Whilst this image is hilarious (I love thse cards) it is probably true. 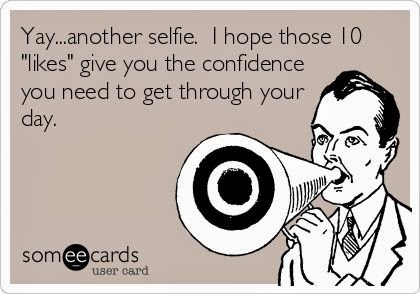 Let's face it many arn't happy with their first shot- but you should be! 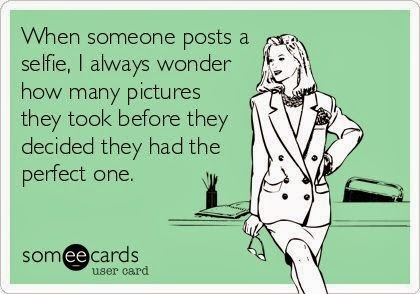 Beware this can lead to you obsessing and taking hundreds of photos unecessarily. But it is a benefit as you arn't stuck remembering that once in a lifetime moment with a photo you aren't happy with. You know what angle, height, lighting and background suits you, or at least the you you want to portray. You can capture yourself how you want to look in a flattering way. It may be worth remembering that however you look in a picture won't always represent you in real life so you should embrace how you look from all angles! #3 Who else is going to take your picture? In times when noone else is around, or you don't want to ask a stranger for fear of having to ask them to retake, it is just easier to take the photo yourself. And then there were the filters. Brightness, Contrast, Sharpening, Exposure, Saturation, Effects and The Crop! What more could you need to change what you've captured to be exactly how you want it. 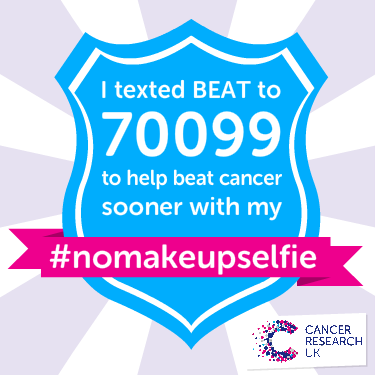 Whilst this is often the sarcastic response to the selfie haters out there, perhaps it does the trick. Someone liking a picture of you can't help but make you feel more confident. 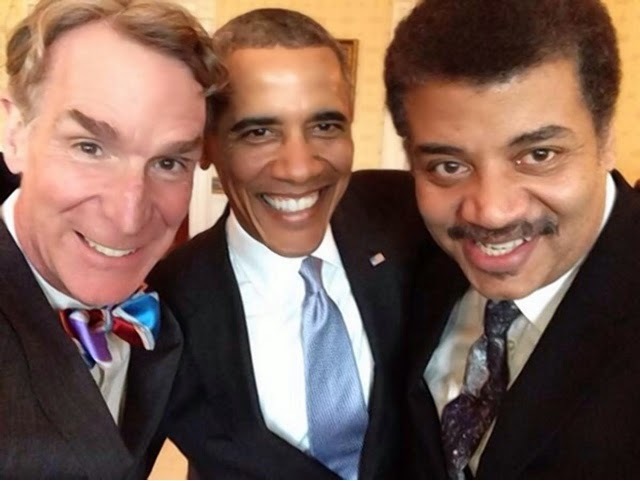 Then there was the group selfie. 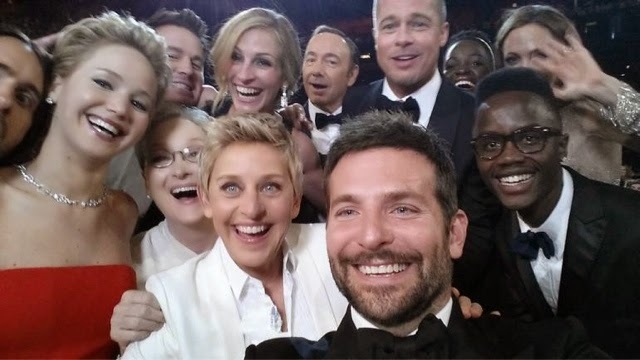 Made infamous by Ellen DeGeneres at the Oscars, as the most star-studded selfie there ever was. It features Jennifer Lawrence, Channing Tatum, Julia Roberts, Kevin Spacey, Brad Pitt, Lupita Nyong’o, her brother, Angelina Jolie, Bradley Cooper, Meryl Streep and Jared Leto and Ellen herself. Props to Ellen for a getting a selfie with 10+ people! 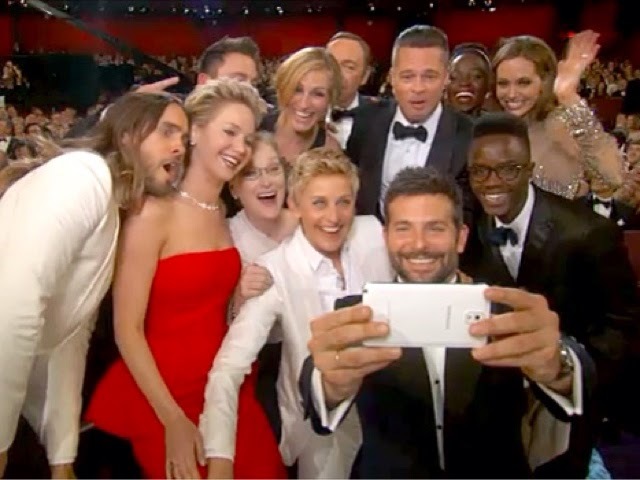 Although I feel Bradley cooper is the one who deserves the credit as he did take the photo after all. 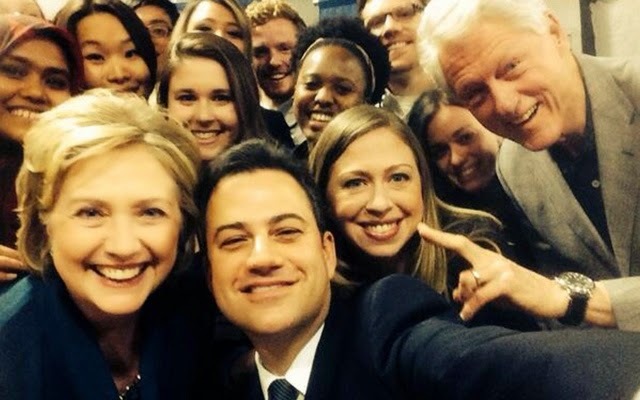 The selfie has prompted other stars to reenact the group selfie with there famous friends including Jimmy kimmel (and the entire Clinton clan - practically American royalty) and President Obama who challenge Ellen with their selfies. 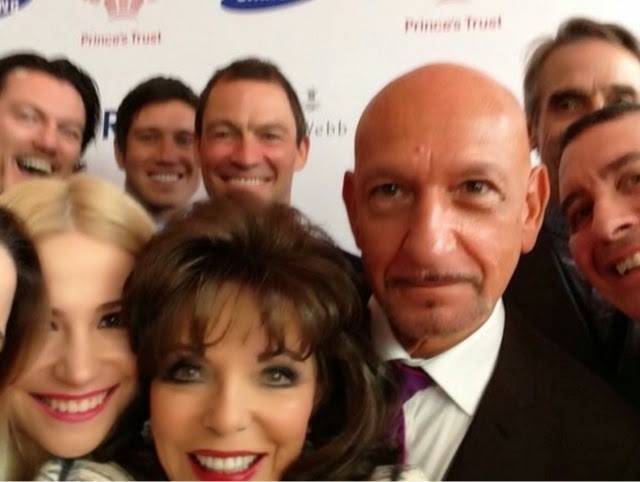 But the trend didn't stop across the pond as Joan Collins recreated the infamous snap at Princes Trust and Samsung Celebrate Success Awards this month. Joan captures Phillip Schofield, Anna Williamson, Laura Whitemore, Luke Evans, Tess Daly, Sam Bailey, Pixie Lott, Vernon Kay, Dominic West, Jools Holland and more. Decidedly more B-List than Ellens, but it's in the spirit and a good attempt. 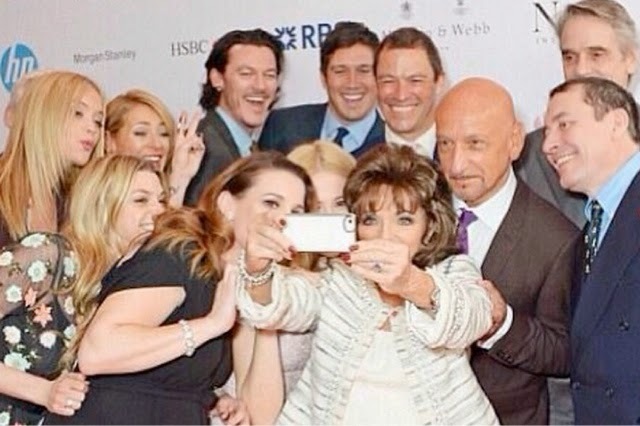 The celeb group selfie is probably my favourite trend to emerge out of all these. If there's no one there to take the shot you want why not do it yourself! I know as bloggers the selfie is your primary mode of photographing as you need to document a lot of the products you are recommending. I thought I'd share with you a few of the selfie crazes around at the moment and say that although a lot of fuss has been made around the narcissistic nature of the self-portrait, I am willing to embrace it (although I have been doing so for a good few years!) 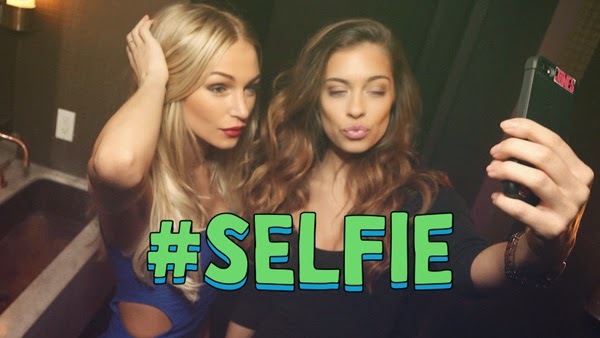 and think if it's for a good cause, entertaining or if it's of the self-indulgent kind (maybe keep these to a minimum), the selfie is here to stay.